Milliman Magic Saves North Carolina More Medicaid Money Than Was Actually Spent « They Said What? The CCNC website says CCNC is “saving money” and yet the federal government data above notes that North Carolina Medicaid’s costs are between 24% and 40% higher than the costs in surrounding states. How is this “saving money”? North Carolina has suffered cost overruns amounting to more than a billion dollars just since CCNC became the provider for almost all non-disabled adults and children in the state. How is that track record consistent with “saving money”? Why did you hire consultants — and pay them more taxpayer money than any other consultants had ever been paid to do this work — who had never done this type of analysis before and didn’t even realize that the answers were already online? 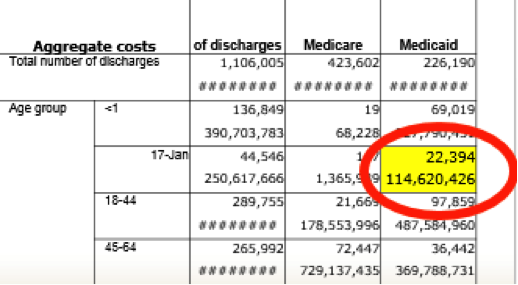 How is it possible to save at least $177,000,000/year starting in 2007 in children’s admissions when the government’s own data collected expressly for the purpose of studies like these shows you only spent $114,000,000 in 2006? Your defense has been that 2006 was not the baseline. However, the years prior to 2006 all show spending figures lower than $114,000,000. So which year was the baseline? You have also said that there is no baseline period. Can you point us to any other study in any reputable journal which did not have a baseline period? Why did you suppress all the government data above that completely contradicted your findings, or did you not know the government collected this data both on comparative per capita costs and on admissions by age group and payer? If you did not know about this online data, shouldn’t you be changing your conclusions and/or returning North Carolina taxpayers their money? If you thought this authoritative government data showing the opposite was irrelevant or wrong, could you explain why? Were you aware that Mercer’s previous study for North Carolina was also thoroughly discredited for not using that government data and thereby coming up with an impossible answer (the study has quietly been removed from the Community Care of North Carolina website as a result)? 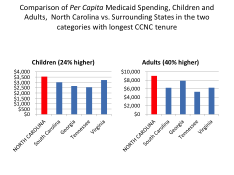 If surrounding states have similar Medicaid programs and most North Carolina children were already in CCNC, why not just take advantage of that “natural control” and compare the state as a whole to other states, especially because the federal data mentioned above had already been collected for all those states? In your Letter to the Editor following publication of the above article questioning your savings, which consisted of four questions about the savings calculation, why you didn’t answer any of the four questions the article asked? The very first page of your report says the decline in admissions more than offset the increases in other categories, thus netting out to the massive savings you calculated. Yet after it was shown that admissions did not decline at all, you said in your Letter to the Editor that the decline came from “categories other than admissions.” Which is it – admissions accounted for more than 100% of the net savings, offset by other categories, or other categories accounted for all the savings? Page 19 of your report says “other Milliman consultants may hold different views.” If members of your own organization wouldn’t agree with you, why should others agree with you when you suppressed data, contradicted yourself, and found mathematically impossible savings? Admission rates in the specific disease categories CCNC was focused on — asthma and diabetes — underperformed surrounding states. In diabetes admissions actually increased on an absolute basis. Where did the savings come from if not from the targeted conditions? By Al Lewis in Patient-Centered Medical Homes on July 23, 2014 . Uh, North Carolina counts ages 0-20 in their analysis; you count ages 1-17. While not adequate to explain the financial discrepancy in its entirety, this sloppiness makes your analysis look, well, Millimanesque. And someone needs to have my 6th-grade son show him how to make “17-Jan” print as “1-17” in Excel. You are certainly right (though “looks Millimanesque” are fightin’ words) in that I should have noted the slight discrepancy. Not because it really matters but because we’re all about getting it right, which means a zero tolerance for non-transparency. Such are the standards of the “countererrorism” segment. Thank you for that. Thanks again for your thoughtful comment(s). Appreciate your reading this so carefully! I am happy to send you or anyone else a copy of the slide deck. And I forgot to add the substance. The 0-1-year-olds (though Milliman didn’t break them out) were not in the CCNC program, meaning that I would be comparing 1-17-year-olds with 1-to-20-year olds. As for the other 3 years, the major admission is for birth events, and in NC I guarantee you that CCNC is not messing with birth control and abortion, so this cohort would be untouched. In any event the numbers are so far off that even if there were an impact in that group, it wouldn’t move the needle. And if there were, Milliman would have mentioned it in their rebuttal, instead of simply changing their storyline 180 degrees to fit the facts.